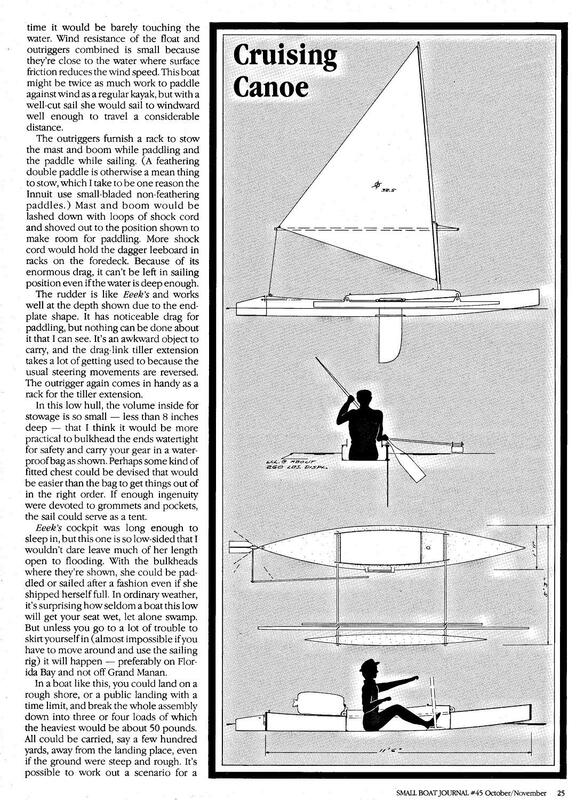 I was just browsing (crab claws), and saw your 'Phil Bolger Outrigger Canoe' page entry at http://www.tacking-outrigger.com/ (great resource, thanks). PCB called it 'A cruising canoe'. It's also known as 'Cartoon #21' from SBJ #45 - PCB sketched out design ideas sometimes for publication, but not developed to the stage he considered a plan. He called these "cartoons". These didn't progress to plans for an assortment of reasons. However, they sometimes contained more than adequate detailed information to build from, and many of those have been built. When built some have proved to be truly excellent performers. 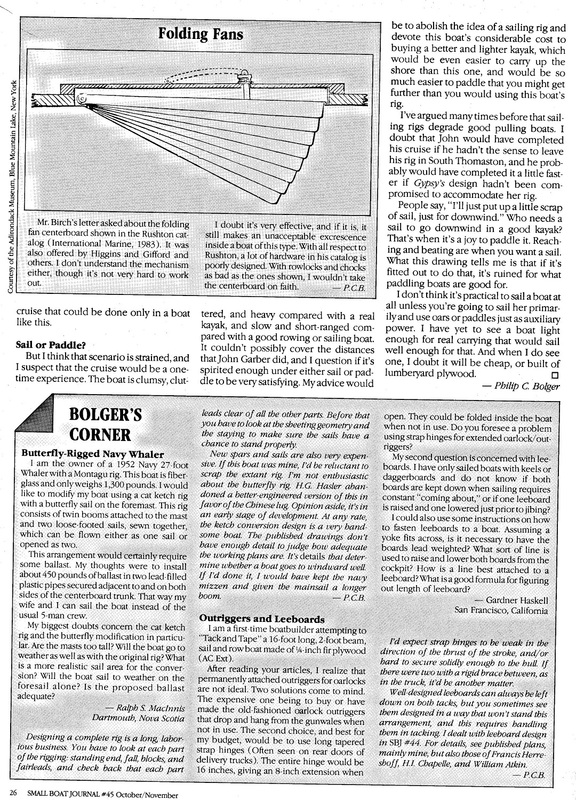 PCB had a regular design discussion column in "Small Boat Journal" where he responded to a chosen reader's wish list request for a boat. This is where most of the known cartoons come from.These columns usually featured 'cartoon' sketches for illustration, but the highly condensed written piece can also be thought of as sketching out ideas and explanations, ie., a cartoon. There are forty odd Bolger SBJ cartoons some of which, where the idea grabbed him, he did progress to completed plans. When engaged on design for a client or a potential client, Bolger also made "cartoons" and these often travelled back and forth in the mail with added thoughts and demands marked upon them, or were pinned up on clients' walls.. I've Cartoon #21 files from a number of sources, so I'll attach some in pdf and gif for your information. 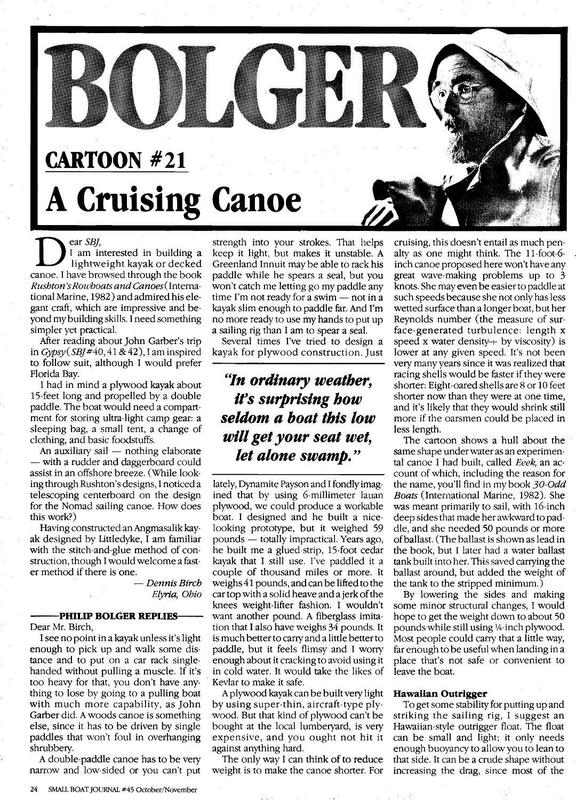 The cartoon is reproduced on the yahoo Bolger Cartoons group files page, so I guess, if you wished to do so, you could add something as content to your tacking-outrigger site. The Cruising Canoe (Cartoon #21) hull is actually very close to being an Eeek! (from Bolger's book Different Boats) with lower sides to facilitate using a double paddle. Eeek! has up to 70lbs of lead ballast bars for added stability, enough stability for most to exercise a wet re-entry, the cruising canoe has the outrigger... &etc.